The nuclear bombs are still exploding and civilisation dying on the first page so where can you find the stamina for the following 390? But it’s a book, a crime novel, and the blurb assures us there will be murder: a familiar event in unique circumstances? You decide to persist, motivated by professional curiosity: how is the case to be handled; crucially, what will be the reactions of a small group of beleaguered people to an investigation into the death of an individual when mankind is doomed? Marooned in a huge rundown hotel in forests some distance from Zurich are delegates attending a convention and a few members of staff, twenty in all. Everyone else has fled, no doubt to starve before radiation sickness kicks in. There are no planes and no internet. There is no government except random ad hoc arrangements formed by survivors themselves. The man who assumes leadership in the hotel is Dylan, the security officer; he has charge of the guns which were formally lent to guests for killing game. Seconding Dylan, and more intelligent if less physically dominant, is Jon, an American historian who appoints himself the recorder and – ultimately – something more than an archivist, although not in a role of his own making. The background of disaster, obscene in its range, is well done. As Jon tells it, diary-wise, each day headed in old-fashioned typed format, for the first forty nine days he is slowly recovering from shock but with Day 50 he takes a grip on himself and commences a meticulous chronicle, because that’s his job. He is, in fact, the true leader of the group although it’s a long time before he assumes command. He is sometimes helped, often obstructed, by the women, who have power but conserve it – with the exception of Tomi, a careless young American student, who is alarmingly amoral. Tania is the doctor: responsible but stressed and hopelessly overworked. Sophia is the honest chef who continues to feed the motley group with the same kind of fatalism demonstrated by Yuka, who’s Japanese and the indomitable mother of two small children. It’s on Day 50 that a girl’s body is found in a water tank and it’s Jon who, in the absence of any other authority, takes on the responsibility of an investigation into her murder. His motivation is hazily attributed to a suggestion that there is more to life than survival: that where there is no justice it must be invented. In this novel there is none of the confidence and nobility of Shute’s On the Beach as the nuclear cloud approached New Zealand although in The Last there is a glimpse of a pattern in current events. Is it possible that this group is not random but chosen, that its members have been brought here by design? People start to question not only their faith but the fact that they have no faith. There are clues of a sort in the personal stories which the murder suspects relate to Jon: a process similar to the witness’s statements by means of which an investigating officer arrives at the identity of a killer. Ultimately we have a picture of a volcano waiting to erupt, and the survivors’ desperate attempts at a relatively ordered existence (food rationing, doctor’s surgery, philosophical discussions) are shattered by violent action when they venture to the city for medical supplies. In a supermarket they are confronted by two former delegates from the hotel: professors, formally amiable cultured colleagues. There is an argument over the contents of the pharmacy and Tomi, the impulsive student, shoots them dead. 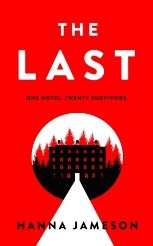 It is obvious now that the people in the hotel are not after all the sole survivors, that discussion on selection and the possibility of the presence of some supernatural power is less important than the immediate threat from other survivors. And yet, despite the likelihood of cannibals roaming the forests, that they may even have infiltrated and be hiding in corners of this rambling building, despite the group’s preparations for escape, Jon is still obsessed by the compulsion to discover the identity of the girl’s killer. An interesting experiment spiced with elements of horror and, against all the odds, with a resolution that is satisfactory if uncomfortable. A writer’s book: not entertainment but after a breathing space it will repay a second reading if only to work out how Jameson fashioned its intelligent construction.